I pinned this recipe at least a few months ago. It really blew me over when I saw the cake, it was amazing and the recipe sounded amazing too. It is chock full of peanut butter cup and chocolate and the frosting is a creamy peanut butter frosting. When I found this recipe I knew that I was going to save it for a special occasion, such as my daughter’s birthday. Lisa loves chocolate and peanut butter so I knew that it would be the ultimate birthday cake. It turned out that not only did she love it; the rest of the family loved it also, except for Mike who is the only one that doesn’t like peanut butter. 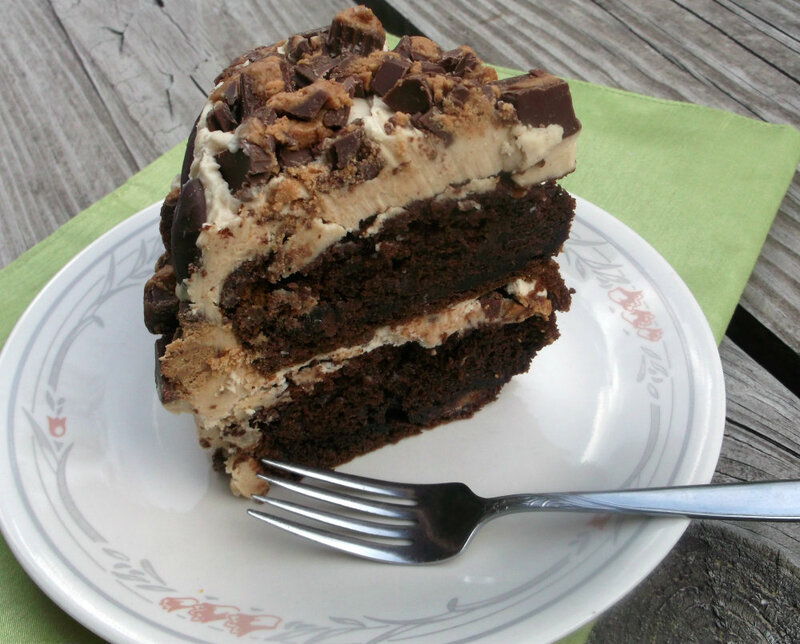 Seriously, if you like peanut butter and chocolate you have to make this cake. It will blow your socks off it is that yummy! 2. In a very large bow, mix together everything except the Reese’s Peanut Buttercup. Batter will be very thick, stir in the Reese’s Peanut Butter cups. Pour batter into cake pans that have been greased and floured. Bake for about 10 minutes more than the cake box suggests or when checking with a tooth pick it comes out clean. 3. Note: I used 2 8-inch cake pans; I think they would do better in 2 9-inch cake pans or divide the batter into 3- 8 inch cake pans. 2. Frost cooled cake. I frosted the top of the first cake and top of the frosting a sprinkled chopped Reese’s Mini Peanut Butter cups. Place the other cake on top and continue to frost the rest of the cake. Chop more Reese’s Mini Peanut Butter cups and garnished the cake. I bought a 2.5 pound bag and used almost the whole bag. 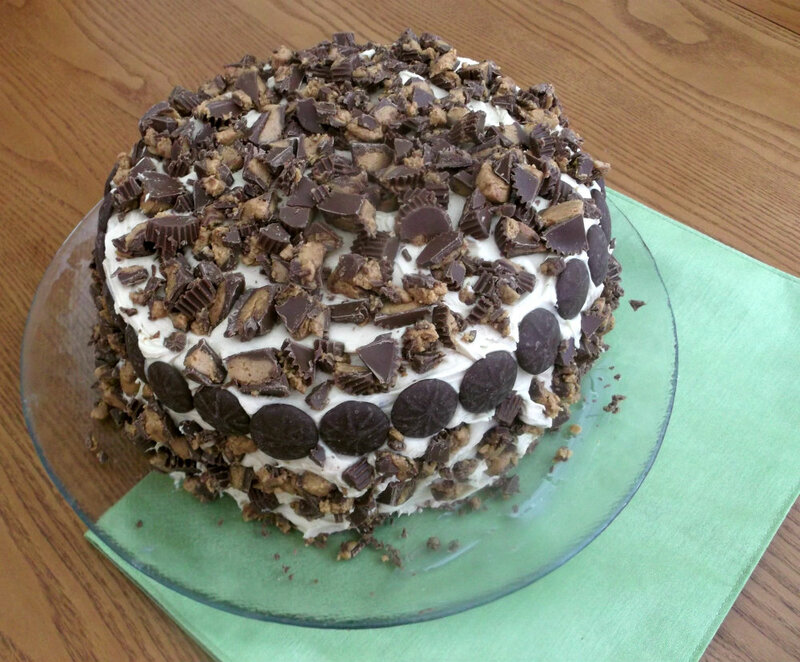 I did take some chocolate candies to garnish part of the cake. Do your own thing and garnish the way you would like to. I make the same cake, only I’ve never added the Peanut butter cups. 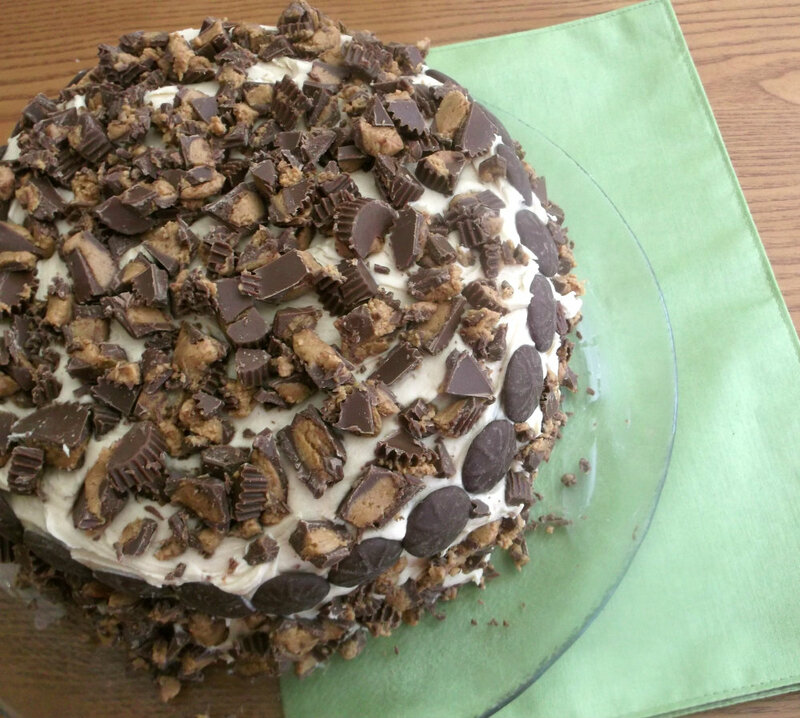 One of my sons love chocolate and peanut butter, he’d love for me to make this. You just made this pb and chocolate lover very happy! That looks incredible! I wish it was my birthday. Chocolate and peanut butter is such a great combo, isn’t it? This look terrific. Definitely something I need to try – thanks. My hubby’s birthday’s on Wednesday, I’m trying to find a perfect cake and this one has just earned many points.